The Mysterious Benedict Society and the Perilous Journey by Trenton Lee Stewart–I didn’t review this one because while I really enjoyed it, I didn’t think I had anything else to say about MBS that I hadn’t already said in my original review. Plus, I quit reading after this book. I tried to read the next one, but I just couldn’t. I felt like I had already been through so much with Reynie, Sticky, Kate, and Constance, what more could possibly happen? Oh, I do love the stories, but I’m just not much on finishing series. (Except maybe The Incorrigible Children of Ashton Place–I really do want to find out what happens to them!) I don’t consider this MBS situation a failure, though, because I have since hooked–completely, irrevocably hooked–my girls on them. It started with Louise, who’s not adverse to reading recommended-by-mom titles (yet!). She started reading the first story a few weeks ago, and for a seven year old she made really steady progress, finishing it within a week. She has since gone on to read the subsequent two titles and is currently working through The Extraordinary Education of Nicholas Benedict. Score! Lulu finally picked up the series after watching Louise read them for a couple of weeks, and she’s hooked now, too. 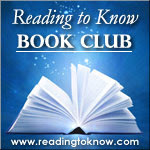 This next month I plan to read Island of the Blue Dolphins by Scott O’Dell for the Reading to Know Bookclub because I’m the hostess! 🙂 We’d love to have you join in and read this Newbery winning title. Since last month’s Nightstand, I’ve shared my thoughts on a couple of read-alouds I’ve read to my children: The Brave Little Toaster by Thomas M. Disch and The Princess and the Goblin by George MacDonald. I’m currently reading aloud The Story of the Treasure Seekers by E. Nesbit, and I hope to have it finished in time to share my thoughts about it this Read Aloud Thursday. 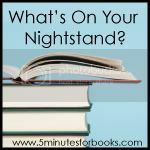 Posted in: Books	Tagged: What's on Your Nightstand? Awww, congrats on your new baby! Enjoy him — it really does go by quickly (in retrospect :). I loved MBS too, haven’t read beyond the first one though. I know what you mean about sometimes not wanting to finish a series. My 16-yr-old and I still enjoy recommending (or non-recommending) books to each other! Books are one of the favorite bonds we share. Have a fun day with your baby … awwww! I enjoyed the first MBS, but just haven’t been motivated to read others in the series. I’m looking forward to Blue Dolphins, especially as I just saw this morning that the same author wrote The Hawk That Dare Not Hunt By Day, which I read several years ago. I just saw the read-along of Edith Schaeffer’s book yesterday and want to jump in on that, too. I read it in early married years and have been wanting to revisit it. I just heard The Princess and the Goblin quoted in a funeral, of all things, likening a mom’s battle with cancer as holding on to the golden cord of truth while descending into the goblin’s den. My interest is piqued in reading the book — I don’t think I’ve read anything by MacDonald yet. Congratulations on Benny! Exciting times. I have read The Hidden Art of Homemaking more than once and loved it, even though I don’t agree with all of it. It inspired me to add more beauty to my home (I can be quite a minimalist). I plan to read with you next month for Island. I *think I remember some mature stuff, so I’ll do it on my own instead of with the kids. Congrats!! And yes– nose in a book definitely counts for something!! I had to click over to your review of the Incorrible Children. I have never known what to make of them. I think I checked one out for my daughter when it first came out years ago, but I’m not sure if she ever got to it. Even though she’s 14 1/2 now, we both still love a good middle-grade read aloud. It sounds like we’d like this series together, so I’ll put it on our list. It takes us a loooong time to get through 200 or 300 pages in our brief fits and spurts of reading aloud, but that’s okay. I can’t believe it’s been three weeks either. He’ll be walking and talking before you know it! Then I shall not consider MBS a fail in your household if your girls devour it (in your place). 😀 ha! I had to laugh about the MBS. I read the first two and then I was done, but not my kids. They love them. Thanks for the suggestion of Unglued. I actually have it on my Kindle, but forgot about it. It’s DEFINITELY okay for a new season in life to change your reading habits (at least, it had better be, or I’m in trouble! :-P) I guess many adults have had the same sort of reaction to MBS. I read all of them, but definitely enjoyed the first the most–and had waning attention with the last. I *did* enjoy The Extraordinary Education of Nicholas Benedict rather a lot, though.